way to improve a person’s overall self-image. While having beautiful straight teeth is important, even more important is the need to alleviate any potential health problems associated with the teeth or jaw. Crooked teeth or jaw problems may contribute to improper cleaning of teeth, leading to tooth decay and, possibly, gum disease or total tooth loss. Orthodontic problems that go untreated can lead to chewing and digestion difficulties, speech impairments, and abnormal wear of tooth surfaces. Over time, excessive strain on gum tissue and the bone that supports the teeth can affect the jaw joints leading to problems such as headaches or face and neck pain. 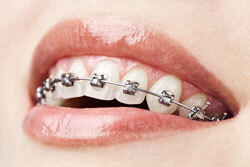 Would you like to learn more about braces from Allen and Allen Orthodontics? Call our Rockwall, TX officie today at (972) 772-2500 to learn more today!